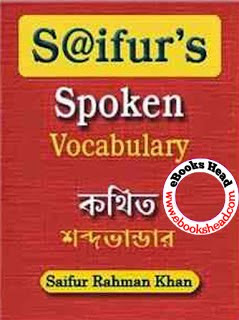 Saifur's Spoken Vocabulary (English to Bangla) by Saifur Rahman Khan is to learn English and the speaking book is written by Saifur Rahman Khan. The first book was published by Saifur, Dhaka, Bangladesh. The book will help students, trainees and job seekers learn English and speak fluent English. Saifur Rahman Khan is a former professor at the University of Dhaka. Now he is owner of Saifur's Academic Coaching Center. Saifur's Coaching Center have many branches in Dhaka City and outside Dhaka. Saifurs Publication publishes various types of jobs seeking and university admission test. Popular Books of Saifur Rahman Khan and Saifur's are Saifur's Viva question Bank, Saifur's Natural Spoken, Saifur's Elementary Spoken, Saifur's Bullet Bishwa, Saifur's Bangladesh Test Paper, Saifur's Math, Saifur's MBA etc Download Saifur Rahman Khan English Learning Book, Bank Jobs Books, University Admission Books, Bank Job Solutions, Writings, Saifurs Coaching Book etc and Read it.